Elizabeth Bard has written a book to make me sigh with happiness. Lunch in Paris: A Love Story with Recipes (NY: Little, Brown and Company, 2010), is a very snappily-written memoir of how this native New Yorker fell in love with her future husband, his family and his country. From the grace with which he dealt with a splat of pigeon poop while on a romantic stroll with our author, to his joie de vivre in cooking for his lady on a cramped apartment hot plate, attending tap dancing camp and film studies conferences, and tenderly caring for his ailing father, I have to say I fell in love with Gwendal too. This wonderful book is the current selection of The Cook the Books Club, which is being run this time round by my blogger buddy, Johanna, of Food Junkie, not Junk Food. At Cook the Books, we read a different foodie novel or non-fiction book every two months and then post a roundup of participant's thoughts about the book and any recipes inspired by our reading. 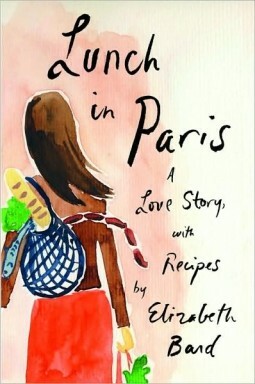 Anyone is welcome to join in the fun (deadline is May 27 to submit a post) and I am delighted to report that our esteemed author, Elizabeth Bard, will be serve as our guest judge to read through the submissions and announce the winner of the much-coveted Cook the Books Winner's badge for his or her blog. I have a few dog-eared pages in Bard's book for delicious recipes that I will make when various edibles come into season: Goat Cheese Salad with Fresh Figs (p. 100), Zucchini Flowers Stuffed with Goat Cheese and Mint (p. 160) and Melon with Port (p. 290), but I had to run out and splurge on a jewel box of red raspberries to make Raspberry Financiers (p. 87), rich little tea cakes stuffed with butter and ground almonds and topped with a perfect raspberry that melt into your mouth. This recipe was terribly easy to make gluten-free. I substituted brown rice flour for the regular wheat flour called for in Bard's recipe and my family was delighted with the sweet results. Hope to see you at the Cook the Books roundup after our May 27 deadline. Next up after "Lunch in Paris" is Sarah Addison Allen's magical debut novel "Garden Spells". They look so lovely! 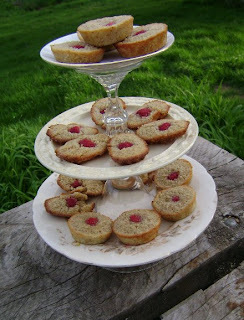 Financiers (or friands, as we call them in Australia) are one of Paul's favourite cakes. I make them as often as I can stockpile the eggwhites! If I weren't so hopelessly behind on my reading already, I'd buy this book immediately. 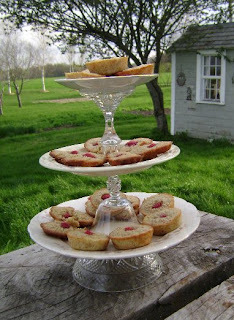 I love financiers, but have never had them with raspberry. I'll bet they were wonderful. I'm playing "beat the clock" trying to finish a crazy quilt in time to enter it in a show next month, but then I am getting the book and trying my hand at those dainty cakes. Great post, Rachel. Great review. I am a little behind in starting the book but hope to have it finished this weekend and I am enjoying it too. I've never made Financiers, and thanks to your success, have now determined to just do it. Your review was fabulous. Here is my review. I loved this book. I am not sure if I have ever had a financier-there are many recipes in this book that I want to try. Great review and beautiful photos. I will have to check out the other links. Thanks!